A year after missing out on racing in California, the squad upgraded to the Pro Continental level and has high hopes for 2018. When riders on the Hagens Berman Axeon team arrived at their training camp in Southern California this month, director Axel Merckx gave them a new code of conduct for breakfast and dinner. The cellphone ban was just one component of a major shift in the team’s attitude during camp, Garrison said. As in years past, Axeon will employ U23 riders, with its stated goal to develop top young talent for the rigors of the pro peloton. The team’s 10-day camp in Calabassas, California included long days in the saddle, as well as various meet-and-greets with sponsors and media. This year, however, the team camp had a more serious vibe, Garrison said. For starters, the team welcomed eight new riders to the squad, including Mikkel Bjerg, the reigning U23 world champion in the individual time trial. Rather than joke around, riders talked about their personal ambitions and commitment to the team. They also rode big miles. Those undertones of seriousness speak to Hagens Berman Axeon’s ambitious plans for 2018. The U23 squad has stepped up from UCI Continental to Pro Continental status, a move that requires no less than a sizable six-figure increase in budget and an increase in support staff. 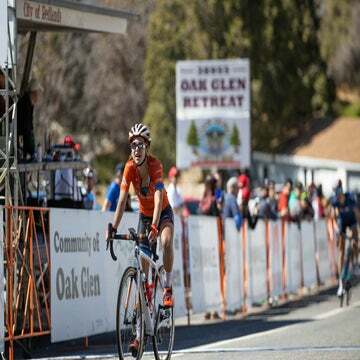 The team will race on both sides of the Atlantic, targeting mid-sized Belgian pro events Nokere Koerse, Handzame Classic, and Three Days of De Panne, among other events, in addition to California’s Redlands Bicycle Classic and New Mexico’s Tour of the Gila. 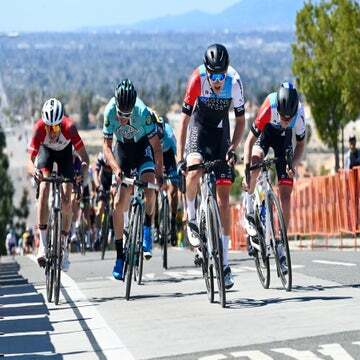 And throughout the spring, Hagens Berman Axeon will try to prove that it deserves a chance to compete in the Amgen Tour of California, the race that snubbed the squad in 2017. In 2017 Hagens Berman Axeon saw its California ambitions doused when the race declined to invite the team to race. Following its step into the UCI WorldTour, the Amgen Tour organization was given just two slots for Continental squads by the UCI. Management gave the spots to Rally Cycling and Jelly Belly Maxxis, leaving race veterans Axeon and Holowesko-Citadel out. The decision came as a shock to team management. Just one year prior, Axeon had turned heads at the California race with its star-studded lineup of Neilson Powless, Ruben Guerreiro, and Tao Goeghegen-Hart. “It was a huge disappointment,” Merckx said. During the off-season, Merckx and team co-founder Steve Berman discussed ways to guarantee entry into the California race. As a UCI Continental team, Axeon would always face uncertain standing with the event. If it were to step up to UCI Pro Continental, some uncertainty would still remain — only WorldTour teams are guaranteed entry. Yet the risk would, in theory, be less. But the step up to that level requires a host of added expenses and manpower. Pro Continental teams must meet a minimum salary of $37,730 per rider. The teams pay for the UCI’s biological passport program, and they often have multiple mechanics, soigneurs, and even team doctors on staff. Merckx did not say how much Berman is putting into the team in 2018. Berman’s Hagens Berman Sobol Shapiro LLC is a Seattle-based law firm that works on class-action lawsuits. The company previously sponsored the Jamis-Hagens Berman pro cycling team. But Merckx said the growth of the team’s staff and infrastructure has not emptied Berman’s pockets. The team’s roster is set at 16 riders; the same number from 2017. Merckx already employed two full-time mechanics and two soigneurs in the United States, so to meet the team’s requirements he hired an additional mechanic in Europe. Merckx also hired a team doctor to oversee the biological passport program and underwent the UCI’s mandatory director training certification in Switzerland. Whether the team attains its early season goals is largely dependent on the riders. The team saw major turnover after 2017, with veterans Neilson Powless, Christopher Lawless, Jhonatan Manuel Narvaez, and Logan Owen graduating to the WorldTour ranks, and Edward Dunbar heading to Aqua Blue Sport. The turnover opened the door for eight new riders to join the team, and for younger riders like Garrison to step into a leadership role. Now 20, Garrison hopes to shine during the team’s trek into Belgium. A sprinter who can also race a time trial, Garrison excels at hard, one-day races. In 2017, he surprised the field with a second-place finish at the U23 version of Gent-Wevelgem. 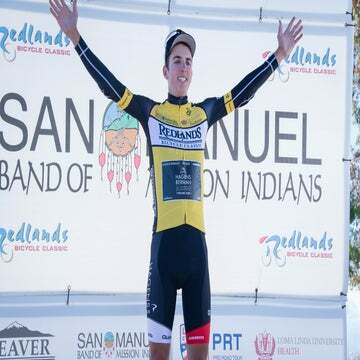 This year, Garrison will also race for USA Cycling’s national team at the U23 versions of Gent-Wevelgem, the Tour of Flanders, and Paris-Roubaix. After all, a top result at those events could justify those heavy miles at camp, and even the cellphone ban.